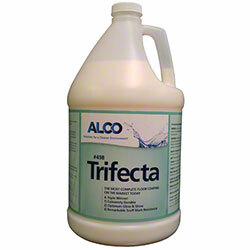 Alco Trifecta - Alco-Chem, Inc. Revolutionary floor finish. The unrivaled durability of this finish is due to advances in acrylic, urethane, and cross-linking systems chemistry. When high speed burnished, exhibits levels of gloss 30-40% higher than conventional high gloss finishes. Superlative results on all types of resilient tile, vinyl composition, terrazzo, and sealed wood.